ROCHESTER, Ind. (WLS) -- Three siblings were struck and killed and another child was injured at a school bus stop in Indiana Tuesday morning, Indiana State Police said. Indiana State Police said the bus was stopped in front of a mobile home park in the 4600-block of State Road 25 with its stop arm and exterior lights flashing. As the children crossed the road to board the bus, a 2017 Toyota Tacoma traveling southbound allegedly struck them. 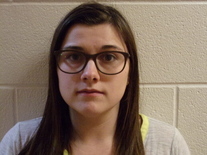 The driver, 24-year-old Alyssa Shepherd, has been charged with three felony counts of reckless homicide and one misdemeanor count of passing a school bus while its arm is extended, causing injury. She was held in the Fulton County Jail on a surety bond of $15,000 and was released on bond shortly after 7 p.m., state police said. Shepherd is the children's director at Faith Outreach - A Foursquare Gospel Church nearby in Rochester. "He didn't lose one kid. He lost all of his kids. What do you tell your little brother, who's gonna get better? You can't," said Elgin Ingle, uncle. An 11-year-old boy, identified by state police as Maverik Low, was taken to Parkview Hospital in Fort Wayne, Indiana, where he was undergoing surgery for multiple broken bones and internal injuries, police said. "I saw the pickup truck completely smashed in and I thought, 'Ok, somebody hit somebody else' and then I saw the school bus and I saw the two little bodies laying on the ground," said Monika Manuszak, neighbor. "Police said there were no brakes used, what are you doing where you're not paying attention?" Ingle wondered. Shepherd stayed at the scene and is cooperating with authorities. Police said it is unclear why she did not stop. "I watched my brother change his whole life around," Ingle said. "Now they're gone because someone wasn't paying attention." "I haven't seen first responders and troopers cry in a long time," Indiana State Police Sergeant Tony Slocum said. "When the children's father had to make identification of his children, that was just gut-wrenching. We saw tears today and our hearts just go out to them because most of us have children and we can't imagine the pain that he felt today. It was heartbreaking; it's still heartbreaking." The school corporation said in a statement, "Our school corporation has suffered a tragedy this morning. We have learned of three student fatalities and one student seriously injured and airlifted to a Fort Wayne hospital as they were hit by a vehicle while boarding their bus. We have deployed all school counselors to meet the emotional needs of our staff, students and parents. We are awaiting to learn more confirmed details but wish to ask the community to come together to pray for the families, our students and our staff."